Why has the West disbursed vertiginous sums of money to the Palestinians after Oslo? What have been donors’ motivations and above all the political consequences of the funds spent? Based on original academic research and first hand evidence, this book examines the interface between diplomacy and international assistance during the Oslo years and the intifada. 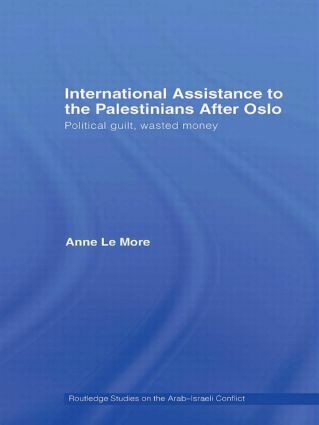 By exploring the politics of international aid to the Palestinians between the creation of the Palestinian Authority and the death of President Arafat (1994-2004), Anne Le More reveals the reasons why foreign aid was not more beneficial, uncovering a context where funds from the international community was poured into the occupied Palestinian territory as a substitute for its lack of real diplomatic engagement. This book also highlights the perverse effects such huge amounts of money has had on the Palestinian population and territory, on Israeli policies in the occupied Palestinian territory, and not least on the conflict itself, particularly the prospect of its resolution along a two-state paradigm.